One of the most exciting features that Mac lion and Mountain Lion offers for iPod users is the iCloud service. With the iCloud on your Moutain Lion, you can easily get your music and songs backup in iCloud and transfer back to your own iPhone 4S/iPhone 4/iPhone 3GS/iPad/iPad 2/iPod/iTunes. However, iCloud is only applies to the same account, you still cannot transfer music and songs from the iPod to new iTunes/Mac/PC, let alone transfer music or songs from or to others’ iPhone/iPad/iPod and more. 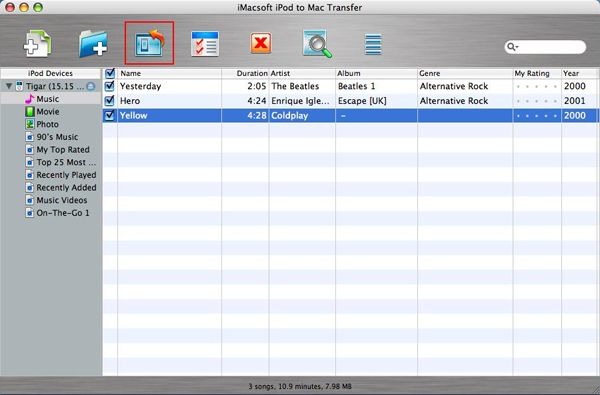 The following is a step by step guide on how to copy and transfer music/songs from iPod touch/iPod mini, iPod nano to iTunes on Mountain Lion, backup iPod touch/iPod mini/iPod nano to Mac Mountain Lion. 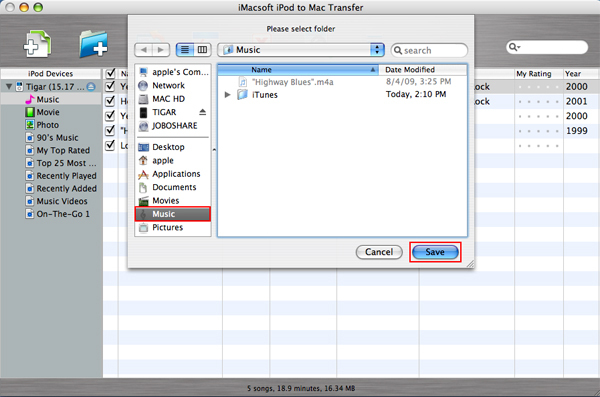 This guide is also applied to transfer movies, videos, photos, ePub, PDF, Audiobook, Voice Memo, Podcast and TV Show from iPhone/iPad/iPod to Mountain Lion, iPhone/iPad/iPod to iTunes on Mountain Lion, iPhone/iPad/iPod to iPod on Mountain Lion and Mac Mountain Lion to iPod transfer. 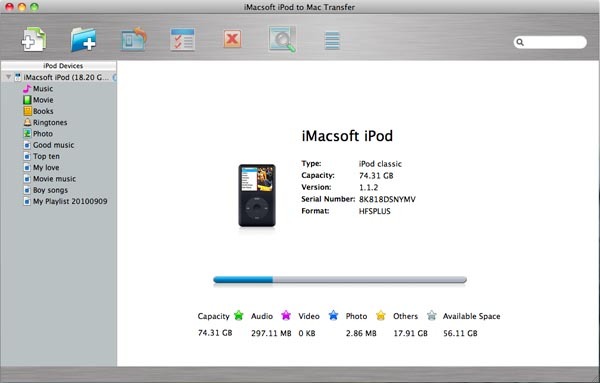 Free download iMacsoft iPod to Mac Transfer, install and run it. Connect iPod to Mac. Once connect iPod to Mac, you can see all info about iPod device such as Type, Capacity, Serial Number, Version, Format, etc. 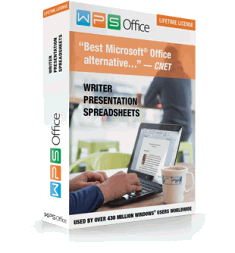 are shown in the main interface. If you wanna get full version, please purchase this iPod music to Mac transfer to obtain the license code. Click “music” icon to open iPod music/movie library folder, you can see all music files are displayed in the interface. 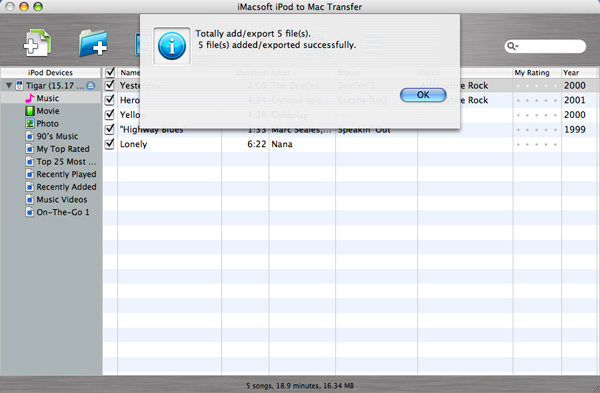 Locate and check the music files you wanna transfer to Mac Mountain Lion, and press “export checked files to local” button or choose “export checked files to local” in the top “Export” menu.